Normally I do my research when trying a Coffee Spot for the first time, but every so often I walk past somewhere and that’s enough for me. So it was with I Am Coffee: I was actually en-route to another Coffee Spot when I saw it while walking down St Mark’s Place (in case you’re wondering, St Mark’s Place is what E 8thSt is called for the three blocks between 3rd Avenue and Tompkins Square; I thought only us Brits did that with our street names!). The first thing to catch my eye was the sign: calling your coffee shop “I Am Coffee” is enough to get my attention any day. It’s a bit of a challenge, really. Choosing “I Am Coffee” means you either have a hell of a lot of front, or you really know about coffee. Fortunately, Giovanni, the man behind I Am Coffee, knows about coffee. I mean, he REALLY knows about coffee. Standing in I Am Coffee and talking with Giovanni was the coffee highlight of my time in NYC on the recent trip and that’s not counting the coffee, or the place itself. It’s a must visit! Calling your coffee shop “I Am Coffee” throws down a challenge, but it’s one which the owner, the delightful Giovanni, rises to with grace and charm. It runs in the family mind. His brother and uncle run “I Am Wine”! The first thing to say is that I Am Coffee is going to win the 2013 Smallest Coffee Spot Award hands down. It’s mid-April and I can say this with absolute confidence: no-one is going to beat this. Seriously. I Am Coffee is tiny: it makes places such as Manchester’s Caffeine & Co seem palatial in comparison. In all, the floor space is 65 square feet. Without exaggeration, I could stand in the middle and touch both walls with arms outstretched. It’s not much longer and, bizarrely, is taller than it is long. Giovanni had to fight with the landlord to let him have the space because the landlord wouldn’t accept that Giovanni could even fit a coffee shop into the space, let alone make it pay. The architect who designed the shop, Beppe Riboli, from Cremona, Italy, should win a prize! I Am Coffee is up a long flight of steps a little set back from the street and fits perfectly into a little niche on the left-hand side of what could generously described as a large porch. There’s a sliding glass door, which Giovanni likes to keep open if it’s not too cold and inside is a counter with room for a cake display, brew bar, hot chocolate dispenser, grinder and espresso machine. Everything else is stored on a series of ingenious shelves on the bare brick wall at the back that reach all the way up to the ceiling. Giovanni and Katerina stand behind the counter, while there is room for perhaps five customers to stand on the other side, enjoying their coffee. You would think that I Am Coffee was made for takeaway sales only, but Giovanni begs to differ. Everything can be served in proper cups, while Giovanni likes nothing better than to stand and chat with his customers. Everything in I Am Coffee is artisan-made; the cake, for example, is made in friend’s restaurant kitchen to a recipe by Quirico “Chicco” Lucherini, also from Cremona, while the coffee is roasted by Manuel Terzi. I Am Coffee opened at the end of 2012 after two years of intensive research and nothing has been left to chance, with painstaking planning going into every aspect of the place. Giovanni hails from just outside Venice and, in preparation for opening I Am Coffee, went back to roots of coffee making, seeking out experts in each different type of coffee and learning how to make it. Every coffee is different and, according to Giovanni, has different requirements. I started with an espresso; I was going to try something else, but the two customers had just finished their espressos and I was struck by their dinky cups. I know, I am easily swayed! Then I got talking to Giovanni and he started making me coffee. And more coffee! And more coffee! I think I came close to dying from caffeine poisoning that day! 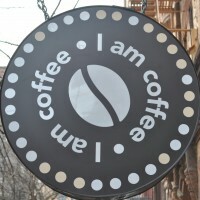 Take a look at the gallery to see what I had and then pay a visit to I Am Coffee. It’s worth it! March 2014: You can also see what I found when I returned to I Am Coffee almost exactly a year after my first visit. This entry was posted in Closed, Coffee Shops, Evening Opening, New York City, Takeaway by Brian Williams. Bookmark the permalink. I always find your blog interesting and enjoyable. I really like your style of writing and think you would also do well as a travel writer.